I haven’t been able to stop humming Tony Bennett tunes since Friday night when I saw him live for the first time. And I don’t think I’ll ever forget what it was like to experience him flashing that billion-dollar smile and wooing a sold out crowd of awestruck fans at Ravinia Festival. If you’re going to do it, this is certainly one way to celebrate your 85th birthday and the forthcoming release of a new album. Since the MTV VMAs are set to kick off later tonight at 8pm CST, I’ve also been wondering how Bennett will approach the performance as he returns to the VMA stage with Lady Gaga and others to pay tribute to the late Amy Winehouse. So in this post, we’ll get you ready to experience the VMAs virtually at home. And I’ll share some live tunes I recorded on Friday night. But first let me tell you how Bennett ruled Ravinia on his way to VMAs. I had never seen Bennett before but I’ve always been a big fan of his legendary jazz tunes. And I loved how my generation re-discovered and re-embraced him during the eighties and nineties, especially the MTV: Unplugged album. So with all those thoughts and emotions swirling around in my heart and mind, I was super stoked to experience the magic of a live Bennett show in person. As we shared with you during our John Legend and the Screaming Lady Experiment, Ravinia is one of the most unique places to see a live show in Chicago. It’s one of those venues where the atmosphere is almost as memorable as the music experience, because once the sun goes down the scene on the lawn area just outside the pavilion seats is a beautiful spectacle to behold on a summer night as hundreds of mini-candles flicker on the picnic tables transforming the venue into a magical sea of sparkling light that buzzes with pre-show excitement. As we walked along the grounds on our way to the Pavilion, I had fun overhearing fans swapping stories about seeing Bennett before, or others like me, who were expressing their excitement about seeing him for the first time. When Bennett took the stage it was like a king had entered the venue. Waves of cheers and a long ovation erupted from the Pavilion and rippled out to every corner of the park. Then things really got going when Bennett and his classy and deft backing jazz quintet kicked it into high gear right from the start. Like a magic switch was instantly turned on, I saw some couples spring from their seats and start dancing, waltzing and swinging each other around in joyous and carefree celebration, while other fans opted for a more low-key chair-grooving subtly tapping their toes and blissfully soaking up Bennett’s still powerful operatic and ever-golden croon. At 85 years old, his voice was rich and commanding, amazingly nimble and strong, and nothing short of righteous and tender at all the right places. But it was his showmanship, gift of storytelling, and constant expression of gratitude and humbleness that took the elevated the intimacy of the night and demonstrated to me why he’s one of the best jazz singers of his era. Along the way he candidly spliced in anecdotes about his first days in the music business. One that got all of us laughing was an amusing story about how he didn’t want to sing Hank Williams’ “Cold, Cold Heart” because he said was from New York and knew nothing about country music. And the punchline to the story was that after the song was recorded and fans loved it, Bennett explained that Williams actually called him up telling Bennett to stop ruining his songs. I also learned something new when Bennett explained how Bob Hope gave him his stage name when Hope told Bennett to shorten it from Anthony Benedetto to Tony Bennett so it would fit on the marque. And the rest, as they say, was history. As Bennett brilliantly cruised through a medley of Gershwin songs and classic tracks – “Smile,” “I Left My Heart in San Francisco,” “Fly Me To The Moon” — I was amazed at how fresh and full of energy he and his band was. Those cats could really jam and groove the bass, drums and piano solos. And if I didn’t know any better I’d think it was as if they were all playing and singing these songs for the first time. Bennett headed into the last song and eventually took his gracious final bows for evening and I gazed up into the twinkling blanket of stars above us and then back down at the stage, and I couldn’t help but wonder how this Ravinia show would compare to tonight’s MTV VMA show. And I What About The Time He Spent Recording with Winehouse? That said, I’m sure there will be a palpable sense of emotion and a community of joy, grief and mourning as fans and fellow artists reflect and express their emotions surrounding Winehouse’s music and her unfortunate early death. Speaking of emotions and live music, during the Ravinia show Bennette dedicated a song to Lady Gaga but I thought it was interesting that he didn’t say anything about Amy Winehouse. That said, I couldn’t help but wonder what it was like in the studio when Bennett and Winehouse recorded the “Heart and Soul”. Did that studio moment influence his Ravinia set even though he didn’t mention her? And what will we see during tonight’s VMA show? Have You Got Your Moonman Badge? Alright, now let’s briefly talk about our ongoing Foursquare, brands, venues and social medial experiment. I thought it was interesting that when I checked-in on Foursquare at Ravinia I happened to unlock the VMA Moonman Badge. I’m not entirely sure how I did it, but I think it probably had something to do with the fact that I’m following MTV on Foursquare and Bennett’s connection to VMAs. There wasn’t any Foursquare discount or special that I unlocked, just a funny little badge. 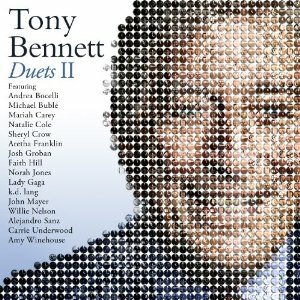 It would’ve been cool to get a code for a discount on the new Duets II album or maybe a link to download a track. Alas, I’ll continue to keep you updated and share any more info as soon I get it. Have you unlocked any MTV VMAs badges or special promotions on Foursquare? Continuing our virtual concert experiments, we’ll be tuning in to explore the action via the home-viewing experience on VMA website where you can find links to mobile apps and other interactive online media and live tweeting. The big initiative with the All Access Live program this year is to provide viewers with a consistent experience, no matter what device is being used. The iOS and Android enhanced features, access to different camera feeds, the Twitter Tracker and clips from the awards are all part of bringing these screens and experiences together. Since I lost my Blue Mikey at Lollapalooza I had to use my Droid and the Android Soundcloud recording app to record the clips. I’m still testing out the Soundcloud app as a possible plan b to the Mikey, so these tracks aren’t the best quality per se. Lets just say that it was good that I was recording a Tony Bennett concert because he’s one of the few artist who’s energy and larger-than-life persona can trump any technical difficulties. Here’s the tracks I recorded during the Ravinia set. Listen in and let me know what you enjoy the most about them. Were you at Ravinia to see Tony Bennett? What about the MTV VMAs? Let us know what you think about Foursquare and whatever else is on your mind and we’ll share your feedback during a future episode of Live Fix Radio.